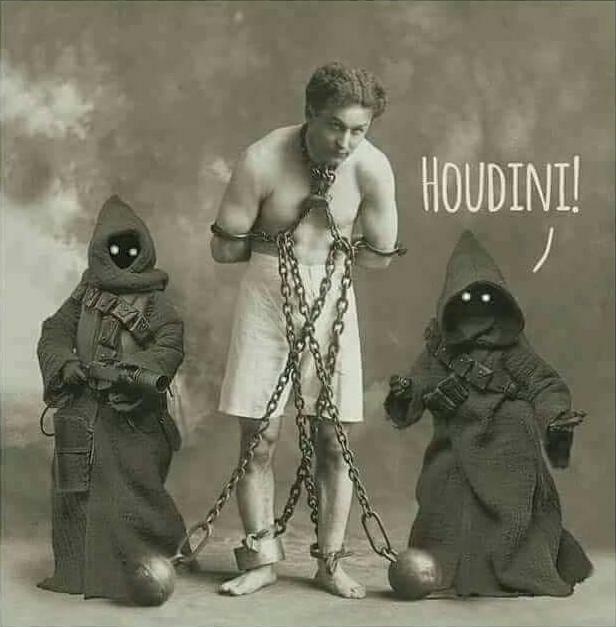 WILD ABOUT HARRY: Does the Jawa in Star Wars say "Houdini"? Ok, today we delve into the important stuff. In the original 1977 Star Wars, does the Jawa who, after zapping R2-D2, call out "Houdini!"? I know I've always heard that. But if a car backfires I think I hear Houdini!, so I've largely kept this to myself. But recently I found this meme online. So it looks like I'm not the only one who hears this afterall. So what do we think? Is there a Houdini namecheck in the original Star Wars? Is George Lucas a closet Harryphile!? Below are a few more "Houdini!" Star Wars connections. Today sees the release of the latest movie, The Last Jedi. Maybe, but it always sounded more like “Houtini” to my ears. "Utinni" is a shout of astonishment or surprise. Wow. A battle cry. An alert to other Jawas, Come here, etc. Also heard in the ‘special edition’ when the Jawa falls off the dinosaur creature. But if Houdini ever appeared on Tatooine, I’m sure they would shout, "Utinni, it's Houdini!" Jawa Trade Language -- I love it. Thanks.